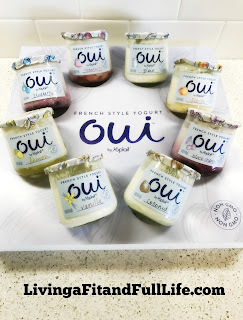 Living a Fit and Full Life: Introducing Oui by Yoplait - French Style Yogurt! 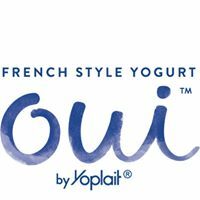 Introducing Oui by Yoplait! A new French style yogurt made with non-GMO ingredients, poured and set in a glass pot. It’s subtly sweet. It’s thick and creamy. It’s a moment to savor. It’s Oui. Available in Strawberry, Blueberry, Peach, Black Cherry, Vanilla, Coconut, Lemon & Plain! Every pot of Oui yogurt is crafted to perfection and poured and set in its own glass pot. What does that mean? We pour our simple, non-GMO ingredients like whole milk and real fruit into the pot and leave it to set for eight hours. During this time, the culturing process takes place in each glass pot, and VOILA … milk transforms into a deliciously thick yogurt! Oui by Yoplait is French style yogurt that is irresistibly delicious! I love that Oui by Yoplait is made with non-GMO ingredients like pure cane sugar, real fruit and yogurt cultures. It's also made with no artificial flavors and no colors from artificial sources making it the perfect treat for the whole family. The thick creamy texture is just the way yogurt should be! I also really like that it isn't overly sweet and that I can taste the fruit in each bite. Oui by Yoplait is the perfect way to satisfy your sweettooth without the guilt. Oui by Yoplait is fantastically delicious and I highly recommend it! Click HERE to learn more about Oui by Yoplait! Follow Oui by Yoplait on social media! I tried it brought several flavors my fave is lemon nice smooth creamy,could use a little more lemon sauce, otherwise it's great.